Biomass pellets as a green fuel and now more and more countries are used it to replace of coal, gas and oil etc. NPM is a leading machine supplier for making biomass pellet and we will give you a general idea of the how to make biomass pellet. About material for making biomass pellet. Usually, wood trunks, wood logs, wood branches, saw dust, bamboo, wheat straw, peanut shell, rick husk, sun flow stem, palm kernel shell etc can be pelletizing into fuel pellet. However, different materials have different characteristics, like heat valve, ask content, nitrogen content etc. The high heat valve pellet is welcome by the market. In China, due to lack of material, lots of pellet plant can't go on constantly production and loss money. Now lots of pellet manufacturers are fighting for materials. 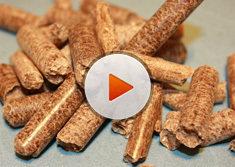 If you are planning to install your own pellet plant, make sure that you have sufficient material supply.